My Myford M type lathe has the original Dewhurst reversing switch fitted onto the front of the cast iron stand. Yesterday leaning across the machine to change the primary drive belt my hip brushed the operating lever with enough force to move it from the "off" position into "FWD" and start the motor. Thus I had my fingers holding a moving drive belt, and my chest on the rotating chuck, a very dodgy proposition. No harm done (other than to underwear) but I'm going to modify the switch asap to a shrouded NVR type. I don't see the need for reversing anyway, so nothing will be lost. In the meantime I'll turn off at the main before playing with the drive belts. On reflection that's probably normal shop practice, but I didn't know it. Not a qualified Safety Manager's finest moment. If any other beginner has a switch like this I can only advise them to think on. Surely all you need is an isolator switch in the incoming feed, and use it when belt changing ? Could you change the lever to a round knob. Reverse is quite useful for cutting metric threads on an inperial machine. I cannot see the fascination to use these drum switches. Is it just because they were fitted as OEM equipment ? Whatever the answer technically they are illegal in that they are a not a no-volt switch. Power cut for any reason and the lathe stops, power is restored and the lathe starts unattended. Even Myford were forced by H&S to be dragged screaming into the 19th century on later models due to the inherent danger of these switches. "Not a qualified Safety Manager's finest moment". But cancelled out by the finest hour of acknowledging the problem and doing something about it. Don't worry, we've all been there, done that, got the blood-stained T-shirt (or nearly so). In my newly graduated days we had a workshop with a Super 7 and a pillar-drill. One had a red button to start, the other a red button to stop (they were wired correctly as the stop buttons were proud of the box, and the start buttons recessed. The Guvnor had the idea that one was on the principle that starting the machine was a dangerous thing to do, so it was red for start, and the other was on the principle was that the big red stop button was because red represented danger when something unintended happened. It seemed daft to me even then because they were different and it caused confusion. Your Myford looks very well cared for, I wish I had the space for one. I wonder what that guvn'r did when he got to some traffic lights ? You're right, it does look easy when its finished. Eugene, I'm glad you were unscathed. My ML7 has the Dewhurst switch but it also has a Memdol single phase direct-on-line starter upstream. The Memdol is the version that incorporates an NVR. I also have another Memdol in the control box for my Tauco pillar drill. For some reason, when I made that, I incorporated a reversing switch as well, not a 'Dupar' but one of those ex-gov. two-pole three position toggle switches, the type with the luminous paint tip to the toggle, probably hideously radio-active. 'Aving 'ad a thunk, and taking Andrew and Petes points on board I'm in the process of fitting an in line NVR stop / start with a big emergency stop knob, but retaining the Dewhurst gizmo. I got one of these from Axminster ... it sits quite nicely alongside the Dewhurst. You could have saved your pennies on the new switch gear, and just either switched off the socket visible on the wall, or better still pulled the plug out. No criticism intended, as I've no room to gloat after some of the daft tricks I've done. Stay safe, switch off at source. Indeed I could, as I pointed out in my original post. That however still leaves the machine fundamentally unsafe; it's safe working would still rely on any and all users being aware of the potential fault and always operating the correct switch. I may not always be the operator, it could be someone else, who knows? Additionally I might just forget and revert to the habits I've already formed or even get fed up with arsing about with the plug / socket. Better in my view to physically eliminate a hazard than try to avoid it by (fallible) working practice. At present the NVR on / off, the emergency button, and wall switch all drop out the relay and stop the machine. However if I ignore the NVR and use the Dewhurst as a stop switch the relay stays in, so it's still potentially hazardous. There must be a way of wiring the Dewhurst stop switch back to the NVR and have it drop the relay but I haven't figured it out yet. The Dupar switch is four-pole so you should have at least one set of contacts spare. I haven't dug out my circuit diagrams yet (my breakfast cuppa tea is demanding my attention) but you should be able to wire that contact set so that the NVR drops out when the Dupar passes through the 'off' position. That way you'll avoid any I just had to get that one in!! I have the same switch from Axminster fitted to most of my machines, and they have been trouble free for years. I often use the reverse on my lathes when screw cutting, as I do find it easier and more trouble free than other methods. I've never used a Myford for screw cutting (or for anything else for that matter!) but on my Colchester, the electrical reverse lever that traverses with the carriage, and the full width foot brake, are essentials when metric screw cutting. 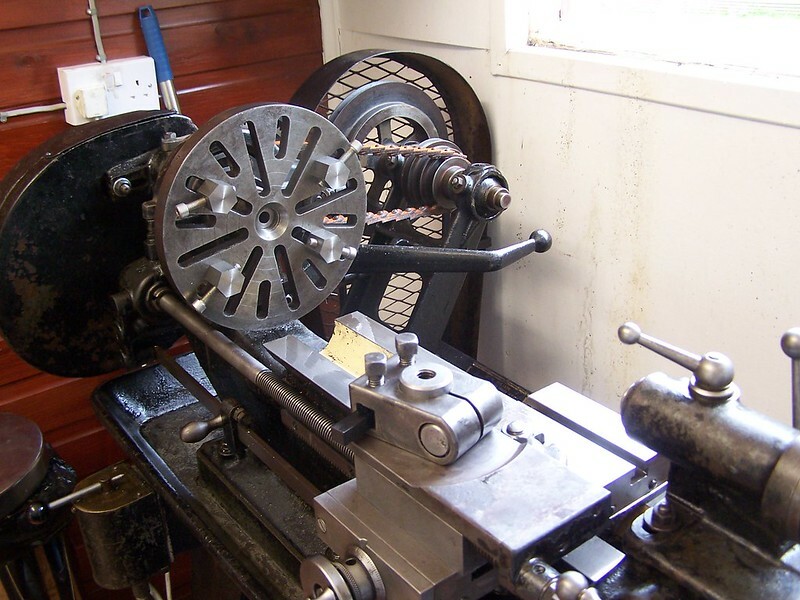 The nut stays engaged, a cut is taken by pressing the lever down and stopped by jamming on the foot brake as I withdraw the tool, which is then traversed to the start by pulling the centre biased lever upwards. I have always used the slow screw cutting speed when reversing to wind back to the thread start position, and have never had any chuck unwinding issues. Some Myford owners have added a grub screw in the back plate to prevent the chuck unwinding in reverse. This of course can happen when using faster spindle speeds. I had a chuck unscrew and bounce all over the floor from my Littlejohn lathe when using a Dewhurst switch. Why do they fit them on lathes with screw mount? We had a platen press, I don't know how to explain it except that you should imagine a one ton lump moving up and down driven by a crank. One day it seized up, we looked closely at it and decided to remove a key that fixed one of the drive gears to a shaft. As the key came free from the shaft it released the whole mechanism and the one ton platen rolled gently down to its lowest position. In doing so the gears rotated at an enormous speed, inwards, if my finger had been touching that gear it would have sucked me in. I still have shivers from the memory. I'm sorry you see my post as "silly". I don't see any warning of a potentially hazardous situation in that light at all, even from an admitted beginner. As a follow up, the NVR switch from Axminster blew after about thirty operations, as did it's replacement, so I'm assuming that there is something amiss in the current feed. I have a Triton table saw on the same circuit that sometimes blows it's NVR switches too. I'd put that down to bad luck, but now these ones on the lathe have popped there must be something nasty in the wood(en) shed. I have an NVR reversing switch to hand, but I'm not going to fit it until some further work on the voltage / wiring / motor front. I'll have to get a professional for that, it's not my area of competence. I don't think he means the thread, Eugene. Maybe his last post before? Steve is right, I meant my post. Sorry if you were offended. No offence taken ... sorry for the misunderstanding norman. I know this is an old thread but I have just read some serious information on safety in using a Reversing switch. I was lucky enough to score a 2nd hand switch last weekend cheap but I am assured still works. I am having an electrician friend install it. The main thing is its an Aussie made Kelly brand which has Reverse and Forward....... well reversed I see no problem and nor does mate just wire it up and change R to F etc on top. Thanks for the warnings all, Power switch off when changing belt etc.